Photo credit: students of A Mundzuku Ka Hina, communications workshop. A life conditioned by the dictates of competition and consumption cannot but bring great social differences along in its train. When we ascribe symbolic values to a consumptive life, ideas will conform to ideals in which our moral duties are the rights of others on us. The subtle way social disproportions are perceived as if a causa sui, something wherein the cause lies within itself creates a world of facts based upon competitive abstractions that endlessly rehearse on a Procrustean bed. 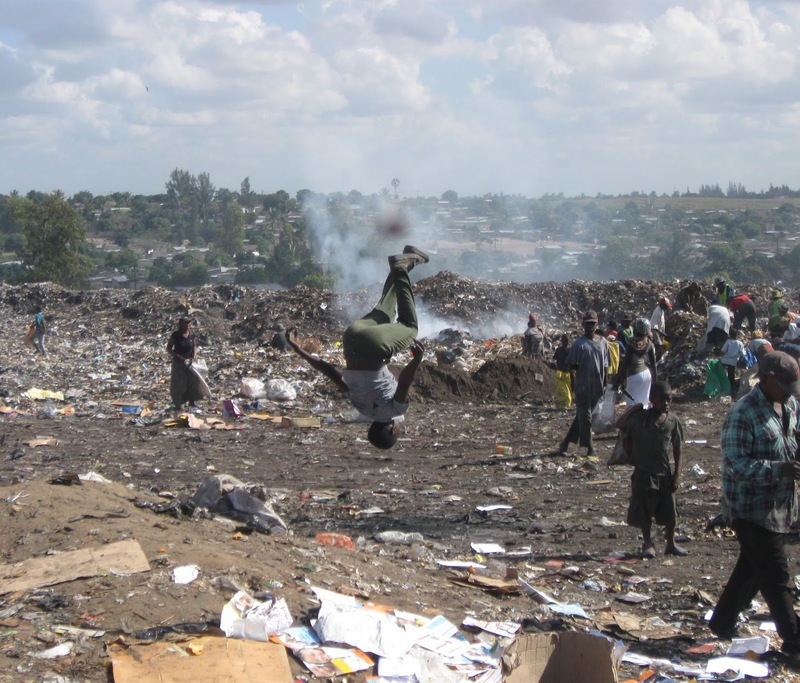 The salto (flying somersault) performed by the boy, who depends for his survival on a rubbish-dump, breaks with this gesture the conditioned life. What he breaks is to function, which means to think, alike a certain ‘life-design.’ His action shows the incompleteness of our relationships in an abstract world. His jump is a jump into a space of non-facts. In the suspension of the movement is the liberating being of lightness. As expected, the focal point of my attention was only momentarily on the suspended image of the boy flipping in the air. The boy’s summersault seems a weak sidebar from the stark backdrop. My attention quickly moved to the other protagonists in this plot; they appear not to care much, either, about the boy’s summersault. To me, these other characters remain laser-focused on their mission—picking through the meager offerings of the rubbish-dump in order to support themselves and their families. Perhaps the other protagonists’ disinterest in the boy’s antic says much about the weight of their ordeal, sorting through others’ cast-offs. If they take fleeting note of the boy’s summersault at all, it’s through disinterested eyes, briefly averted and then quickly turning back to the task at hand. A different (prosaic) take on the situation helps to place the extreme poverty pictured here in numbers-related context. Given the image’s stated source, I assume the scene is set in Mozambique. As of last year, some 14 million Mozambicans live off $1.25 USD a day; the number jumps to 19 million if you slightly nudge up the living standard to $2.00 a day—both dollar figures representing international lines of extreme poverty. In terms of gross national income (GNI) per capita (‘international dollars’), Mozambique comes in at around $580. Which doesn't leave much to the imagination. Looking at the Gini coefficient—which measures the distribution of income across a population—Mozambique ranks around 35th in the world in ‘income inequality’. Income inequality is more striking and despairing when per capita GNI is compared across nations—contrasting Mozambique’s with that of other countries. Case in point, the UK’s GNI per capita last year was $43,340; Mozambique’s was therefore roughly a bare 1/75th of that. Transnational inequality. Sources slightly differ from one another, but these numbers begin to shed light on why we see what we see in the photo’s bleak tableau. Of course, the human-scaled effects socially of such poverty—pernicious and far ranging—bring into sharp focus the meaning of the deceptively mundane numbers and are what really matter! Images are so interesting because they tell so much about ourselves, but sometimes so little about others. For 'us' it is rather difficult to imagine that kind of life where a rubbish-dump becomes the plane on which to evolve life. Which also means to fall in love, to get married, to raise a family, to share sorrow and joy; in short: where one is. The other persons disinterest for the flying somersault, seen from your vision, might also be apprehended as a natural gesture, as something common which is thus left unnoticed. The salto is a full movement, a completeness, and the students who made this picture might have intended to give expression to their wholeness? Remains that an image does not stay with the photographer, and the truth and untruth of the image is always made up by the spectator. Thank you for your impression and highlighting the abstract numbers, which might shed a light on a foolish world that in the image resonates but in which the image also illuminates man's capacity to survive, to be creative and I would say, be intelligent? Yes, thank you Keith for this very powerful counterpoint. Of course, in a sense you are right, but also, in a sense, in focussing on the somersault, Tessa is too. We have in the image a classic juxtaposition, and your pracitcal perspective of locked-in poverty is indeed the contrast, 'the background', with the psychological, spiritual claim that even so, there is freedom possible...? There is no meaning in reason.